Headquarted in Tustin since the late 1970's, Seven Gables Real Estate has recently added an office in Old Towne that occupies an historic craftsman bungalow on South Glassell. President Mike Hickman (center) is surrounded by many of his long-time associates and staff. Take a stroll down North Glassell just a block from the Plaza and you can’t help but notice the historic craftsman bungalow that’s now home to Seven Gables Real Estate. 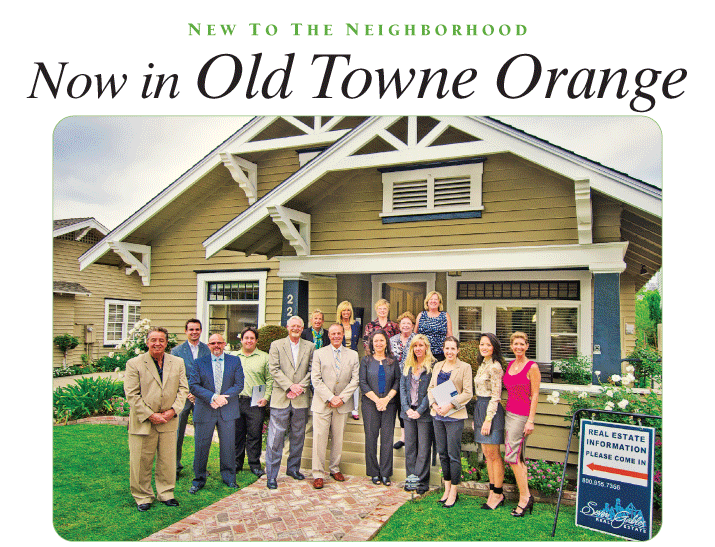 Known for selling distinctive and unique homes, this longtime Orange County firm has recently added an office in Old Towne, where 10 agents welcome the public to drop by anytime for a glass of lemonade or bottle of water. There’s even doggie water bowls on the porch for the passersby walking their dogs. It’s just part of the downhome hospitality that’s always been the hallmark of this Tustin-based company, which got its start in a humble trailer in 1976. President and C.O.O Mike Hickman remembers the day in 1979 when the up-and-coming company relocated from its mobile trailer to an English Tudor-style brick building covered in ivy that still serves as the corporate headquarters today. With three offices in Central Orange County, Seven Gables Real Estate now boasts about 250 employees and agents. A Tustin native, Mike graduated from Tustin High and went on to play college baseball at UCI where he played on two national championship teams. He got into real estate shortly thereafter, and 37 years later he’s become one of the most innovative professionals in the industry — with the help of longtime associates like General Manager Lisa Greubel; IT Manager Ryan Hildebrant; Regional Office Managers Pam Huitt and Fred Hinojos; Director of Marketing Sandy Chang and Director of Communications Gina Santanello. Through the years, according to Mike, Seven Gables has sold (or put buyers into) more than 20,000 homes.